Do you have recipes that seems to evolve over the years! I do too and I never seem to get around to updating them on the blog. Which means I'm constantly looking up recipes on here and then I realize I don't make it like that anymore. So today I finally decided to do something about it! 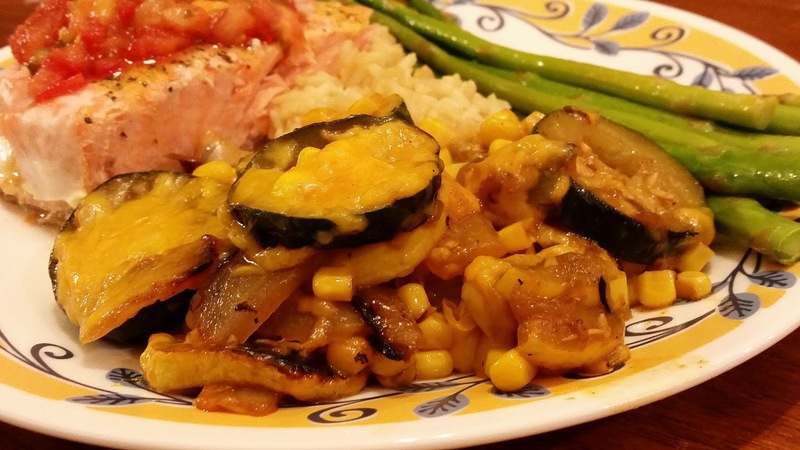 Calabacitas are a delicious side dish here in New Mexico. Full of flavor, low carb, and the perfect compliment to any meat. We have them with steak, salmon, chicken, or even sometimes in place of meat altogether. I've even had a delicious New Mexican shephards pie featuring calabacitas. They are spicy, cheesy, zucchini goodness. My husband and I love them and 2 out of 5 kids eat them too (as soon as my youngest gets teeth I'm sure he'll join in). I previously posted a grilled recipe I use for these but here is my stove top version! Enjoy! In a large skillet, heat olive oil over medium- high heat. Add zucchini, yellow squash, onion and water. Cover and cook until onions are transparent and squash is tender (7-10 minutes) making sure to stir and flip squash/zucchini frequently. Uncover and add garlic. Continue cooking until garlic is frangrant (2-3 minutes). Reduce heat to medium and carefully fold in green chile, spices and corn. Top with shredded cheese. Re-cover skillet and cook until corn is heated and cheese is melted on top. Serve immediately.